A network is being built in the North Western German town of Lünen to collect biogas and burn it to provide up to 30-40% of the town’s electricity and heat. It is due to be completed by December 2009. Local farms will collect slurry from animals, waste from crops, and other bio-degradeable materials, and feed them into special heated tanks (biogas fermenter – pictured above). Here the material will ferment and release methane and carbon dioxide. 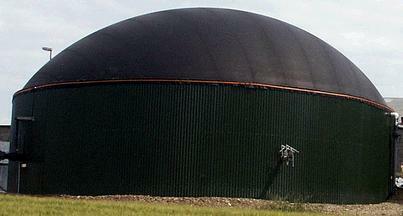 This biogas (similar in composition to natural gas) will then be collected and distributed via the new biogas network to twelve Schmitt Enertec Cogeneration units (combined heat and power (CHP)) dotted around the town generating electricity to be fed into the grid, and heat to be distributed via local district heating networks. The biogas network – the first of its kind in the world – will be constructed using a horizontal drilling robot so local roads will not need to be dug up, and the (quiet, reliable) CHP stations will be decorated with wood and plants so that they are not an eyesore. In total up to 6.8MW of power will be generated – sufficient to heat and power over 25,000 local homes. Alfagy Limited – distributors of Schmitt Enertec combined heat and power plants. 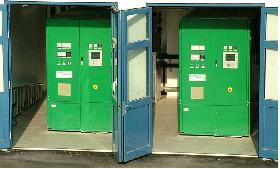 Schmitt Enertec – a leading small CHP plant manufacturer.